Interested in adopting Bubba? Click hereBubba’s adoption fee is $300. Bubba looks so sweet!! 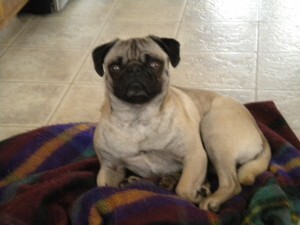 I have a pug who will be 3 in March and I think he would love to have a pug playmate. My pug’s name is MILO; he is very calm (not a alpha! ), loves to ride in the car, loves his walks with me; and Milo is a therapy dog registered with Delta Pet Partners. He goes to school with me 2 days a week (I work with Behavior Disordered kids); the students LOVE HIM!! Milo also enjoys going to the dog park and plays well with other dogs — small and large. I look forward to hearing from you — I live in Coralville, Iowa (next to Iowa City) and can give you recommendations should you require them. Have a good evening — time to go home and get Milo and go for a walk.